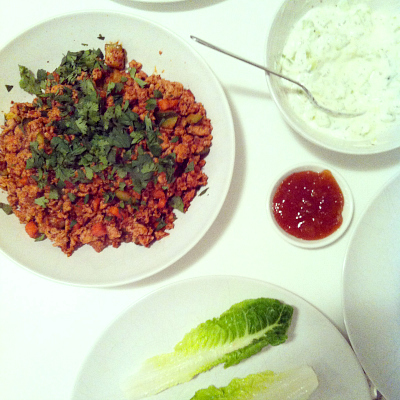 Following on from the success of my spiced lamb lettuce wraps last month, I decided to try the mince with an Indian twist. It was one of those nights when we were feeling so lazy and were contemplating home delivery but I said, “come on, we have all the ingredients, I bet we can make it faster and tastier than anything that would be delivered.” And so we did, and I was right. 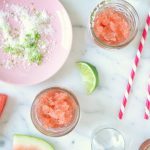 It was super delicious, healthy and whipped up in 15 minutes. Heat the oil in a large frying pan over high heat. Add the mince and ginger. Cook for 2 minutes, breaking up the mince with a wooden spoon. Add the carrot, zucchini and tandoori paste. Cook for 3 minutes, or until golden. Add the stock and sugar and cook for a further 3-5 minutes or until the liquid has reduced and the mince and vegetables are cooked. Season to taste. 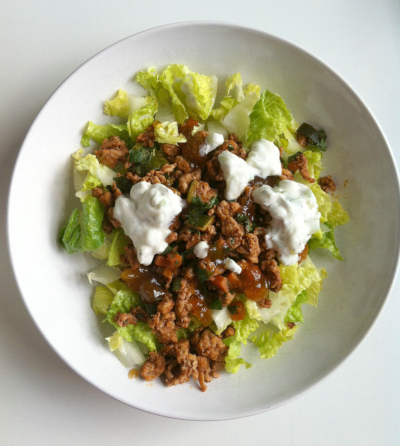 Spoon the chicken mixture into lettuce leaves and top with tzatziki, chutney and coriander. oOo If you have any mince leftover it is delicious heated up for lunch the next day. Just spoon over chopped lettuce leaves and top with tzatziki, chutney and coriander. See image below.